The International Meshing Roundtable is seeking nominations for the IMR-2012 Fellow Award, a reward that recognizes an individual with a distinguished record of research accomplishments in the area of mesh generation. The IMR-2011 Fellow Award was presented to Prof. Kenji Shimada of Carnegie Mellon University. Nominations are due by 15 August. The deadline for submitting research notes for this year’s IMR is 31 July. A research note is a 2,000 word/5 page paper on work in progress or preliminary research results. Authors of research notes are also given a 10-minute speaking slot. The NAFEMS World Congress 2013 will be held 17-20 June in Salzburg, Austria. Abstracts are due 19 October 2012. 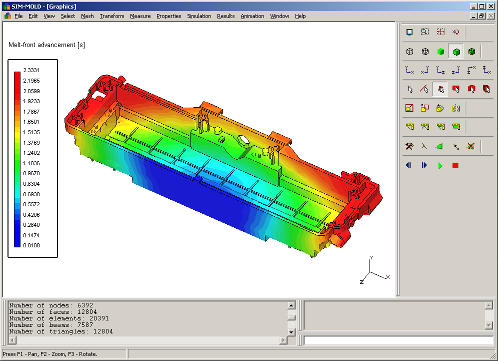 Simtech Solutions has created SimMold 2012 Educational, a freely available, node limited version of SimMold 2012 Professional, their simulation software for injection molding. EADS in the UK is looking to hire a CFD and Tank Modelling Engineer. The Sandia Cooler uses rotating fins to improve thermal performance relative to current designs. Image from Sandia. On his CFD and others… blog, Prof. Z.J. Wang summarizes the results from January’s workshop on High-Order CFD Methods. One conclusion that I found interesting is that high-order methods cannot achieve the expected high-order accuracy on unsmooth flows or geometries. Of interest is the degree of unsmoothness that can be tolerated by high-order methods because to a certain degree all “real world” geometry is unsmooth. High-order mesh generation is also cited as a pacing item for research. Flow (right to left) in the River Tyne is visualized as circular zones around four measured values (oxygen, acidity, nitrates, salinity) with the particle paths influenced by whether the measure value is above or below the average. This visualization of flow in the River Tyne is not what it first appears to be. It’s best if you just read the article. This entry was posted in Events, News and tagged Caedium, IMR, International Meshing Roundtable, jobs, NAFEMS, SimMold, Simtech Solutions, Symscape. Bookmark the permalink.